"Paws" redirects here. There is also a person named Paws. A paw is a body part with digits, used for walking, climbing and holding objects, which can be found on most mammals, reptiles and amphibians. It is analogous to the hand or foot of a human. Glove-based fursuit paws with distinctive pawpads. The paw terminates the fore- and hind- legs of animals which have them, and are referred to as forepaws and hindpaws respectively. They most commonly have five toes, though less are frequent. The toes often have claws on the tip, which in most feline species are retractible (except for the adult cheetah). Several animals have paw pads: furless areas of tough skin on the bottom of the paw, providing good traction and a soft step (which is especially important for predators). 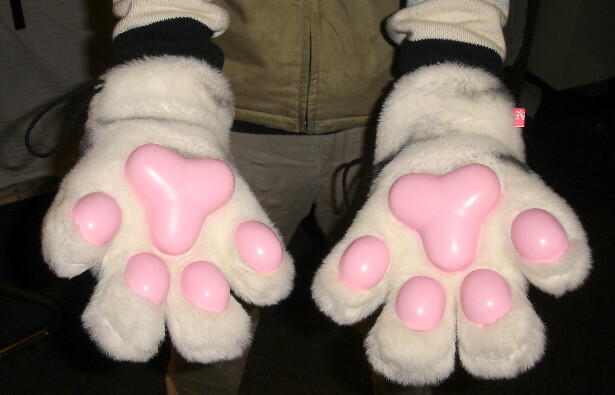 Pawpads are occasionally depicted on animals that lack them, especially rabbits. Many furry fans and lifestylers refer to their hands or feet as paws. Several furspeech terms have derived from it. People may have a pawfasting (instead of handfasting), they may go barepawed (instead of barefoot). The word "paw" can also be used as a verb - to paw somebody or something means to touch with the paws, to paw something to somebody means the same thing as to hand is to normal humans, and to paw off is a euphemism for masturbation. On anthropomorphic characters, the paws are often somewhere between human hands/feet and paws. This allows these characters to do everything that a human could do. Such paws are often shaped like a human hand or foot, furred on top, with a furless palm/sole, with or without pronounced paw pads, and with claws on the fingers/toes. Some very human-like characters may even have fingernails/toenails instead of claws. Many cartoon or comic characters have a reduced number of fingers/toes. Four fingers on each hand/forepaw, three or four toes on each foot/hindpaw are commonly seen in "toonish" artwork, though realistic artists usually use the same number as on the natural animal. Fursuit paws belong to the more complex parts of a fursuit. A realistic look of pads and claws has to be combined with good function - handpaws should still allow to hold things, footpaws should not inhibit walking and should not go to pieces when walking on rough surfaces. The easiest way is to base handpaws on gloves and footpaws on shoes, but more sophisticated fursuiters prefer to build completely custom constructions. The simulation of digitigrade legs is another problem, for which there are a number of proposed solutions among the fursuiting community.